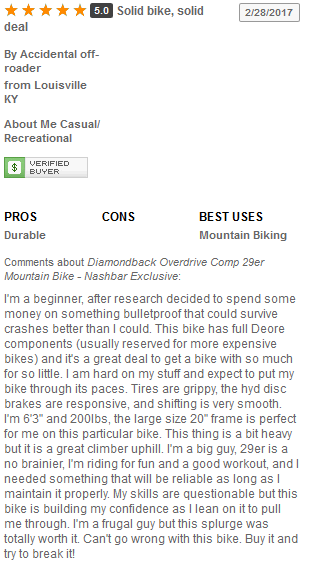 In this Diamondback Overdrive Comp 29er review you’ll discover the truth. If you’re searching for a great mountain bike but are tight on funds, I can relate. I was an avid mountain biker as a teen but stopped riding in my early 20’s. Now that I’m 30 years old, I’ve been re-discovered my love of mountain biking. The problem is finding the best mountain bike without spending a small fortune. You need to be familiar with all the various part of a mountain bike: what they do, how they work together and what manufacturers to trust. It can all get very confusing very fast. But don’t worry! I’ve done the hard work for you. I’ve spent a few years researching mountain bikes and am committed to posting 100% accurate, no-nonsense reviews on as many top mountain bikes as possible. My Diamondback Overdrive Comp 29er review starts right now. If you’re in a hurry and just want to see the best price for the Comp 29er, we got you covered! Click here to see the best price for the DB Overdrive Comp 29er. 1.2 What is the Diamondback Overdrive Comp 29er? 1.6 What Makes the Diamondback 29er Overdrive Comp Unique? In my review, I’m going to touch on a few different aspects. There are certain things you’ll want to be looking for that will impact your purchasing decision down the road. You don’t need a big budget to get a great mountain bike. While there are plenty of expensive bikes available, you can still find a reliable, durable mountain bike under a grand. Consider each component separately. Remember, you can always upgrade a part or two. Sometimes investing a small amount of money into a budget bike gives you a lot of bang for your buck. Guys who like to bike through the mud, over rocks, into the woods and more. This is a bike for outdoor adventure as well as single-track, unpaved (and un-groomed) trails. If you’re new to mountain biking, a bike on a budget is a great way to check out the sport without making a major financial commitment. Mountain biking vets will also appreciate the great overall value of this bike. I’ll be honest – not every part of this bike is absolutely, positively, 100% top-of-the-line. But the overall quality from handlebar to tire is much better than you’d likely expect in this price range. City dwellers are probably going to want something else. To be clear, this bike will get you from Point A to Point B in any urban area. But the ride might be a little bumpy. Sidewalks, paved streets and other city environments are probably better served with a city bike. Those types of bikes will have thinner tires, longer frames and other features designed for less pedaling over longer distances. What is the Diamondback Overdrive Comp 29er? This is a budget-minded bike for outdoor adventures. From wheels to handlebars, this bike is built for rocky trails, wet conditions and everything else nature can throw at you. 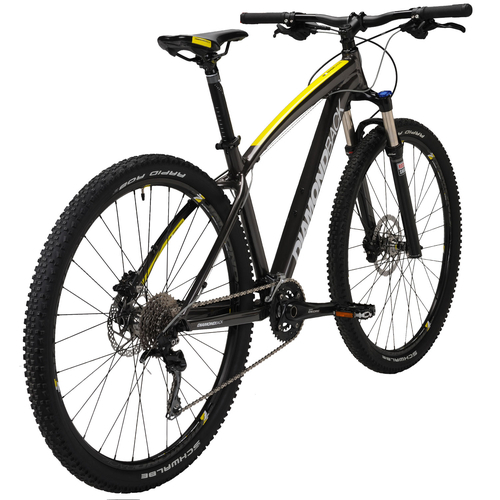 This bike is similar to the Diamondback’s Overdrive Sport 27.5. While the two bikes are similar, the Sport is just overall a bit… less. The tires and frame are both smaller than the Comp 29er. The Overdrive Comp used to have smaller tires, too. I think the decision to switch to the 29-inch tires has really improved the bike overall. They’re some of the bigger mountain bike tires around which makes them fun for bouncing the bike around on challenging outdoor courses. This bike is great for hitting wooded trails, mountain paths, plains or elsewhere out of town. This bike is best for anyone who mainly wants to hit single-trails in the woods, mountains, plains or elsewhere out of town. The large tires will roll over rocks, roots and other outdoor obstacles. This bike can get dirty, take a tumble and otherwise handle whatever nature throws at you. Mountain biking can be as easy or challenging as you like. Trail and cross-country riding is great for beginners. More experienced riders not afraid of a challenge might want to tackle downhill, freeriding, dirt jumping or even Enduro (all mountain riding). Mountain biking is often about anything but a smooth ride. But the right suspension system will help keep you comfortable (and safe). This bike has a Rockshox XC 30 TK suspension fork with 100 mm of travel, which not only felt comfortable but also improved my sense of control. Without a frame, you’ve just got two unicycles. This bike has a 6061-TD aluminum frame, which is strong enough to hold up even after serious spills. I liked how the tubing is hand-built. The custom formed and butted tubing helps give the bike strength without adding unnecessary weight. I had no problem shifting through practically any element and terrain with the Shimano Deore drivetrain. These gears have 2 x 10 shifters, front and rear derailleurs and a crankset. The hydraulic disc brakes are also Shimano Deore with 180 mm front and 160 mm rear rotors. I once stopped the bike while sliding down a muddy trail in the pouring rain! I prefer hydraulic brakes for a mountain bike because they don’t require much pressure to brake. This gives you more control and sensitivity over how fast or slow the bike stops. I love this feature when I’m navigating down a steep hill or trail. Plus, hydraulic brakes have a crisper feel. Personally, the responsive braking action keeps me feeling confident even at high speeds through slippery courses. Large diameter wheels are usually the best choice for a mountain bike because they’re less likely to get stuck in crevices or on roots. The Overdrive Comp has Schwalbe Rapid Rob 29 x 2.25 tires which rolled right over outdoor obstacles with no problem. The wheels have SL7 aluminum double wall rims with matching 32-hole SL7 aluminum hubs. The 14g spokes are laced in a 3x pattern. The tread is aggressive with “bite” (which is a mountain bike for grip, basically). As you might expect, punctures are more likely to occur when mountain biking than practically any other type of bike use. But these tires have a Kevlar belt which helps resistance punctures on the trail. What Makes the Diamondback 29er Overdrive Comp Unique? Most bikes in the below $1,000 price range only have eight or nine speeds. The 29er Overdrive’s upgrade 10-speed rear cassette is basically an extra gear for free. The bike’s 2 x 10 drivetrain reduces the need for one chain ring on the front. This makes finding the right gear a bit easier while also dropping the overall weight of the bike. When shopping for a mountain bike, you’ll hear a lot about durability and tire style. But what about speed? The Overdrive Comp 29er is one of the fastest mountain bikes I’ve ever been on. The combination of the larger tires, light frame and 2 x 10 drivetrain give this bike a real kick you don’t find in many other mountain bikes. This bike is $899.99. While that is pushing the limit of a “$1,000 and under” mountain bike, this is still one of the best deals I’ve found for a bike with these features. Plus, the high quality, durable construction will last for years even with heavy use. You might have to replace a part here or there, but I feel confident saying this bike is basically a one-time purchase which will last a long time. 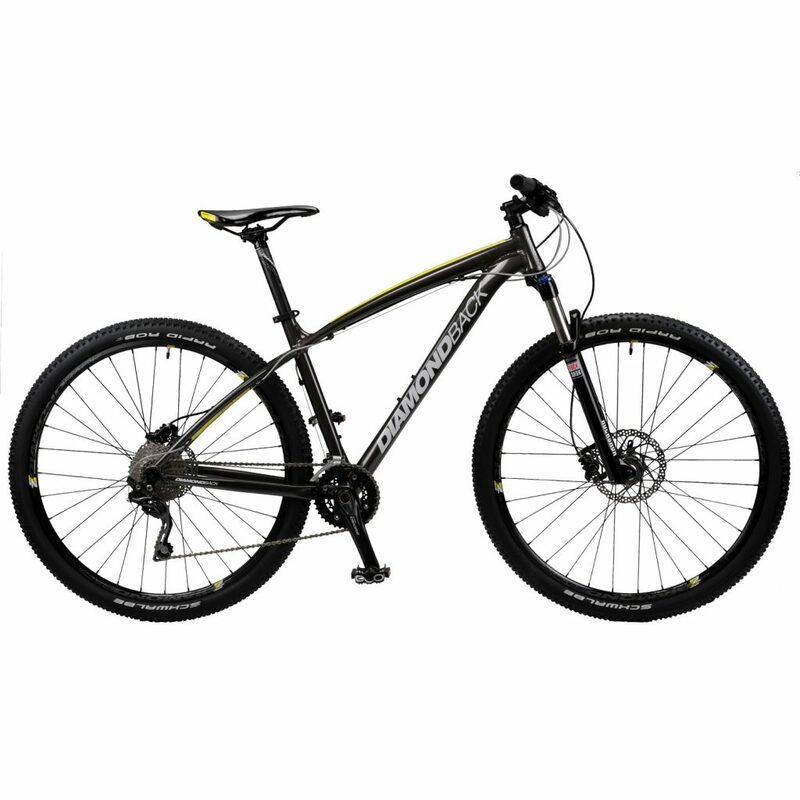 Diamondback Overdrive Sport: This bike is very similar to the Overdrive Comp 29er except generally smaller. The 27-inch tires are two inches smaller than the Overdrive Comp, which means the Sport can’t handle big rocks as easily. Still, the Sport is about $200 cheaper than the Comp. The Sport is a good bike but smaller overall. Click or tap here to learn more about Diamondback Overdrive Sport. Diamondback Atroz: The Atrox has a similar aluminum frame as the Overdrive Comp, with the main differences in the brakes and wheel. The wheels of the Atroz are a smaller 27.5×2.35″ tires by Kenda Nevegal. The Tektro Auriga hydraulic disc brakes offer solid stopping power. Personally, I prefer the stopping control of the Shimano Deore outfitted on the Overdrive Comp. Click or tap here to learn more about Diamondback Atroz. Diamondback Apex Elite: Like the Overdrive Comp 29er, the Apex Elite is a great choice for mountain bike beginners due to the combination of low price and high-quality features. The fork on the bike tends to come loose, at least in my experience. 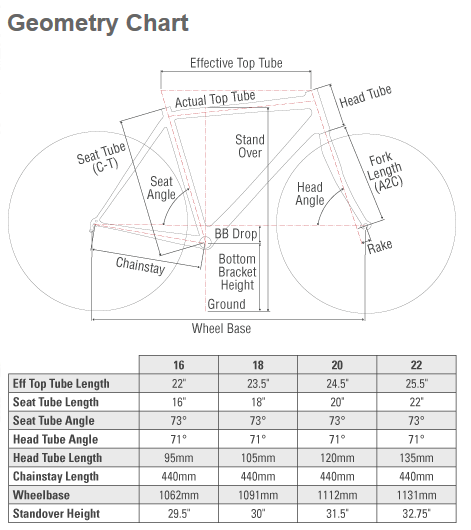 I found the fork of the Comp 29er to need less overall attention. Click or tap here to learn more about Diamondback Apex Elite. Finding the best mountain bike can be confusing at first, especially if you’re new to mountain biking. Do you know how many gears you’ll need? What type of frame will give you the best combination of durability and light weight? What types of brakes work best in the mud and rain? Learning about bikes can be frustrating when all you want to do is ride. 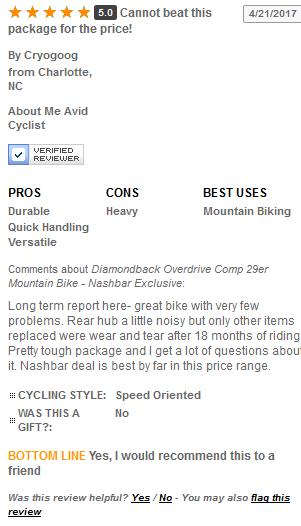 After writing my Diamondback Overdrive Comp 29er review, I feel confident recommending this bike to both new mountain bikers and experienced riders. The Overdrive Comp 29er is a great value overall. Each component is a high-quality part made from a manufacturer I trust such as Rockshox, Shimano Deore and more. The 6160-T6 aluminum is lightweight but strong, which is the perfect combination for a mountain bike. You can transport the bike easily. Large, tough 29-inch tires from Schwalbe Rapid Rob are a bit bigger than most bikes in this size. A Kevlar belt helps prevent punctures even over sharp surfaces. Overall, the Diamondback Overdrive Comp 29er has a great mix of high-quality parts for the price. For under $1,000 you can get a mountain bike which is fast, durable and very fun to use.